This wooden arch is made from FSC certified timber. This sturdy and delightful wood archway is finished in an attractive colouring . 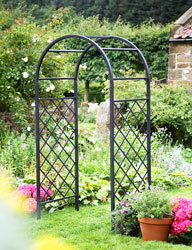 This timber arch has lattice wooden side panels, ideal for growing most climbing plants. 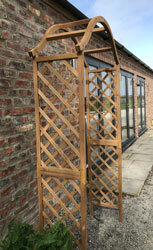 This garden arch made from wood will make an attractive entrance to any garden. Size: 220cm high x 115cm wide x 40cm deep. 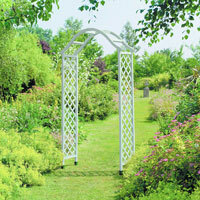 This wood arch will make a beautiful entrance to your garden. This wooden arch has a semi-circular arch top. These wooden arches have lattice side panels. This arch wood is made from timber construction. These timber arches can be used with ground spikes or sunk into the ground. This timber arch is easy to assemble with only four sections to assemble; the side panel are one construction giving extra stability. Size: 2190mm high x 1070mm wide. This green wood arch will make a beautiful entrance to your garden. This green wooden arch has a semi-circular arch top. These green in colour wooden arches have lattice side panels. This arch green wood is made from timber construction. These arches can be used with ground spikes or sunk into the ground. This timber arch is easy to assemble with only four sections to assemble; the side panel are one construction giving extra stability. Total Height Including legs 2.18m. Makes a great feature which can be enhanced with climbing plants. Can be either sunk into the earth or concrete trenches or used with our metal ground spikes. Metal ground spikes made from metal with a PVC green coating to prevent rusting. Ideal for use on wooden and metal arches to secure into soft ground. Size: 22cm high x 6.5cm wide x 6.5cm deep. Ideal for most climbing plants to give height in garden border, heights start from 0.6 metres high up to a extra large height of 3 metres.